"Incubators are for chicklings flying away. Sanctuaries are for phoenixes returning Home." Grad Parties are co-working times and play labs for GTG grads to practise mastery and daring freedompreneurship. Reserve a seat and showcase your new tool / product / service! Seats limited. Only reserve if you shout YES! to your and the world's liberation. emotional freedom and mental peace. It's part 1/3 of the GTG journey for your soul maturation + lifestyle freedom. Seats are limited. Reserve a seat if you declare YES! to your and the world's liberation. automated systems, and time freedom. It's part 2/3 of the GTG journey for your soul maturation + lifestyle freedom. Alchemizing Ayahuasca is a meaningful quest towards permanent liberation and wholeness. Vote on format and shed your worries. 8 seats available (23 interested). For women founders, overachievers, trailblazers and entrepreneurs, who value guided preparation, empowered sisterhood, and illuminating wisdom. As a freedom seeker, who are you here to liberate? As a lifelong learner, what are you here to teach? As a creative trailblazers, why are you here? The function of freedom is to free someone else. Success coaching + psychotherapeutic training to sharply clarify pain points, deeply dig within the Self, and to gracefully ease into higher consciousness retreat. 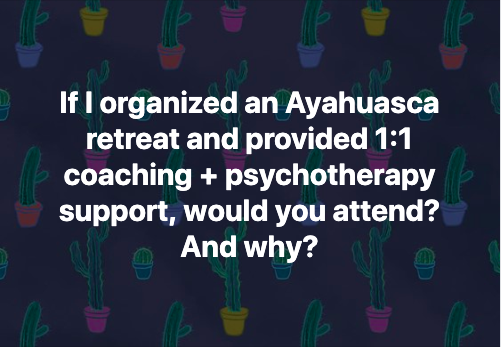 Empowerment coaching + psychotherapeutic integration to sooth your explosive unravelling, to ground your expansive learning, and to alchemize Ayahuasca into a peaceful and permanently new you. From overseas, often more economical to fly into London, Lisbon or Madrid and book a separate local flight to Malaga (via Vueling, Ryanair, or Easyjet). Where it the retreat center? How do I reach the retreat center? What is the retreat schedule like? What are pre- and post-retreat sessions like? Additional plant medicines, such as Kambo, Bufo, etc. Most meals are served buffet style, so you select what you can eat. We will also inform the retreat center. Can I function after the retreat? Yes, you can function, but we highly recommend that you clear your calendar for the week post-retreat, so you can lovingly rest. No. Must first book a chat with Ellany. Can I bring a friend to the retreat? We know your mind better than you do. We won't let you register unless we're sure your heart AND soul truly want AND need this form of liberation. Once registered, there is no refund. Should disaster strike, you can transfer your credit to the following retreat or to another Guide to Grace program. Can I help promote the program? Absolutely, become a partner and receive $150 for each referral! Contact Ellany. "Rivers need banks to flow. If you are the river, we are the banks." On each Q+A, we implement a practical + illuminating GTG tool. Reserve a seat and vote on the tool you want to play with and deepen! A joyful conversation for Divine Rebels and Changemakers, who want deeper missions and freer hearts. My teacher Brené Brown's new book, Dare to Lead, comes out Oct 9! I got an advance copy a few weeks early <insert ecstacy>!! Join us for a "Book Club" live jam on: Brave Work. Tough Conversations. Whole Hearts. Anchor to a grounding sanctuary from the storm of busyness, perfectionism and overwhelm. Access powerhouse friends and deepened mastery of online programs. Alchemize fear, loss, and hardship into a tangible + prosperous digital product, with grace. The best way to learn is to teach! Hear the stories of why we get ourselves into multi-system chaos, 3 practical ways to get out, and how to avoid it in the first place! Integration = Savings. Simplicity = Sanity. Automation = Freedom. It's a mindset and stage of business, where solopreneurs start with: free online tools (chosen out of inexperience and/or scarcity) and end up with: a heap of paid online tools (chosen out of overwhelm), realising (depressingly and/or angrily) that Excel Spreadsheet + check book would have been simpler! Live reading of Ella's journals on: 10 Ayahuasca Ceremonies PLUS 10 Years of Self Liberation, with juicy wisdom and epic insight for soul maturation + lifestyle freedom. Laughter, awe and swearing guaranteed. ​Is total annihilation necessary for totally liberation? Is suffering necessary to enlightenment? The opposite of scarcity is not abundance. It’s not even sufficiency. It’s wholeness. How do I "do" wholeness? We are all instruments who fall out of tune. Who is my turning fork? Who will set me free? As a freedom seeker, who am I here to liberate? ​Before enlightenment, chop wood, carry water. After enlightenment, what now?? As a lifelong learner, what am I here to teach? Want to bypass all the noise and accelerate your confidence, business profits, brand impact, and personal freedom? Through fun, high impact, hands-on strategic sessions + somatic mindset practices... you'll leave the retreat super charged AND a tailored marketing strategy AND the confidence to execute the plan AND a sister tribe to champion you on! How about a lifestyle business filled with high return on investment (ROI), high return on happiness (ROH) AND high return on freedom (ROF)? Most Common Lifestyle Freedom Business Mistakes. Find out how to liberate yourself from random busyness. How to Gracefully Make Six-Figures Doing Everything You Love. Find out how to liberate yourself from the past. Top Tools to Re-calibrate Inner Compasses towards Total Liberation. Find out how to liberate yourself from the fear of success. How to Create a Masterclass that is Wanted + Sellable. Find out how to liberate yourself from overwhelm and disappointment. Megan Murphy and Ellany Lea co-host Face Your Fierce, uplifting stories of trailblazing women, who are living their lives, outside the lines. These badass women picked up the phone when the Universe called. Listen to 20min packed full of vulnerability, wisdom, and real talk about living their "different" and facing their fierce. Fear of success and fear of freedom are real! Learn about: the hardest emotion to be with, the one handbreak that will stop all your momentum, and the family inheritance that traps you. Why do you implement certain tasks, but not others? Learn about: the one strategy to eliminate overwhelm, your top areas of self-sabotage, and the most critical business system to set up. can't out-frugal your way to wealth! Discover how burden, overcompensating, miscalibration, intergenerational programming and cultural indoctrination stifle your success. Why is your business not growing at the pace you want it to? Discover the 4 ways shame stunts your business success, reach and impact; and what to do about it! Celebrating freedompreneurship with ease and grace! Profits not soaring? It's because you've done the right things, in the wrong order. Learn about: the most deadly thought, the most forgotten budget, and the one person to perpetually say no to. How to upgrade a business with ease and fun? Jump through spiritual hoops! Learn about: the first fear to let go of, the two cups to refill, and the final acceptance of truth. Does your business have the 5 essential ingredients to prevent business burn out? Learn about: the delusional ingredient, the in-to-on ingredient, and the wonderment ingredient. Does your online business feel like a tantrum throwing toddler? Learn about the 5 organic stages of wealth, the surest pathway to sanity, happiness and freedom. Part 1 • Doing Business or Busyness? Part 2 • Who are you here to serve? Part 3 • What if the money was possible? Part 4 • How do you enrol a client effortlessly? Bonus Part 5 • How to know if you're on the right path?